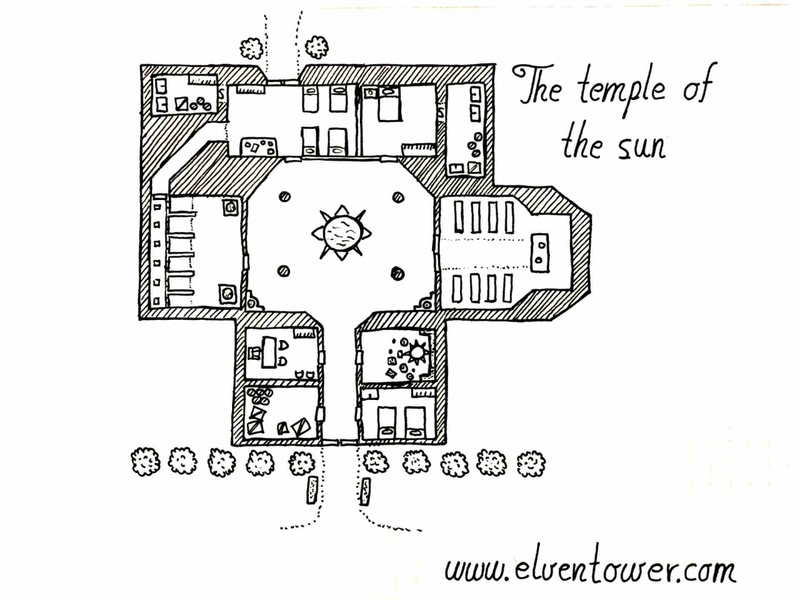 This is the temple of a sun god, which can vary, according to the setting, Lathander in Forgotten Realms, Pelor in Greyhawk or Dol Arrah in Eberron. This is a reputable place, respected above other locations wherever it is located. The priests and acolytes of the sun god are loved by the townsfolk and actively help enlighten their communities. Right after the entrance, there are two doors, one of them leads to a guests room and the other to a storage room in disarray. The next door hold an office that the head priest uses to conduct meetings with important people. In front of the office there is the offerings room, an effigy of the sun is sculpted on the floor, around it, the believers place their offerings and gifts in exchange of guidance and peace. The main hall of the church is home to a bas-relief of the sun on the floor, it’s half a meter high. It’s a work of art. Followers of the church come here and kneel around the sun in circles to pray. Next to the main hall are two chambers, one of them contains the confession boots and the other is a chapel, where a priest can preach and offer guidance to the believers. The back rooms are living quarters for the head priests and acolytes. Each chamber has a secret access to a room beside it. Gold chalices used in masses, myrrh, documents, and other relics related to the sun god are kept safe in the head priest’s secret storage room.